The term 3D-MID (3D moulded interconnect devices) stands for injection-moulded, three-dimensional circuit carriers that have been in use for many years in various fields of application of automotive, mechanical engineering and medical technology up to consumer electronics. In contrast to flexible and rigid-flexible printed circuit boards, which are available in 2D and then finally only in the final stage of the production process. Application can be spatially adapted, MID parts are already produced in 3D manufactured and equipped. This allows a close functional integration of mechanical-constructive and electrical functionality to be possible. This combination of functionalities opens up completely new possibilities in system development. The portfolio of alternative 3D and 2.5D technologies such as flexible and malleable printed circuit boards is thus supplemented by possibilities that can only be realized in the overall system by MID in a technologically sensible and cost-effective manner. Here 3D-MID offers the intelligent and elegant solution of system development. CONTAG offers a comprehensive service for 3D-MID projects, from consulting in the design and selection of a suitable material through rapid prototyping to series production and assembly. Rapid prototyping allows 3D-MID prototypes to be produced within a short time and for a manageable budget and functional models. The validation of the design and the functionality gives the security for the success of a project before the investment into the series production. CONTAG relies on 3D printing in combination with laser direct structuring (LDS). Rapid prototyping can also be used for end applications in low quantities. CONTAG offers stereo lithography 3D printing (SLA) up to a size of 145mm x 145mm x 175mm as a possible method. Compared to other 3D printing processes, the SLA process is characterized by an excellent surface finish and attention to detail. The functional principle is based on the layered curing of a liquid resin using a UV laser. The total number of minimum layer thickness 0.025mm. Thus, high-quality base bodies for 3D-MID prototypes are created from CAD data. The high temp material is a variant that meets the thermal requirements of reflow soldering processes and numerous end applications. In addition, the chemical stability of SLA materials speaks for itself. They are chemically resistant to alkalis, acids, (mineral) oils, fats, hydrocarbons, salt water and hydrogen peroxide. After 3D printing, the surface of the base body is coated with the special lacquer ProtoPaint, which was developed for the LDS process (see below). Structured laser irradiation activates the paint according to the layout and then metallizes it. Layout structures up to 200μm line/ space can be realized in this way. The glossy black lacquer is characterized by high adhesion and thermo stability and also gives your product a noble character. For the series production of 3D-MID there are various established processes which CONTAG is proficient in and can provide. There are various established processes for the serial production of 3D-MID. For relatively simple circuits production in 2-component injection molding may be worthwhile. Here, in sequential injection molding steps combine two different plastics in one molding in such a way that the structure of the electrical layout is already shown. The plastic that makes up the layout structure, in that it can be metallized by chemical processes. The component is thus structured metallized, whereby the structure is determined by the design of the 2k tools. 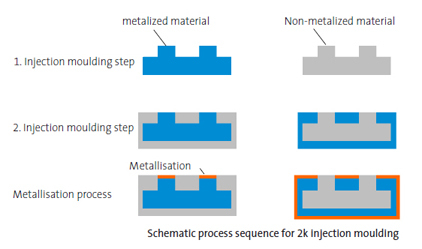 Before 2k injection molding can be the method of choice, especially for very high quantities. Besides the following disadvantages the high initial costs and long development and production times, above all the lack of flexibility and the limited resolution of the electrical layout. In terms of initial costs, structure resolution and flexibility, the 1k injection molding + LDS process is more suitable for many 3D-MID projects. This process is therefore becoming increasingly popular at CONTAG. The highest possible structure resolution of up to 100μm line/space can be achieved on molded parts produced using the 1k injection molding process using a stainless steel tool. Stainless steel tools are also superior to alternative tool materials in terms of dimensional stability and accuracy of approx. ±0.05mm. However, the production costs and months of delivery times for the tool pose high hurdles. For this reason CONTAG also offers an alternative 1k injection molding process based on milled aluminum tools, with which dimensional accuracy of approx. ± 0.08 mm can be guaranteed even for large quantities. The achievable structure resolution of 200μm line/space is completely sufficient for the majority of MID applications. With the aluminum material, costs and delivery times for the injection molding tool are significantly reduced with minor losses in product quality. In addition, the entire range of LDS-capable thermoplastics can also be used in this variant, from simple ABS substrates to LCP or PEEK high-performance plastics. Generally, thermosets are also suitable for 3D-MID applications. In contrast to PCB technology, however, thermosets have so far played a subordinate role for 3D-MID. The thermoplastics, especially the high-performance plastics, meet the requirements in most fields of application. In addition, thermoplastics are easier to process than thermosets due to their thermo formability. 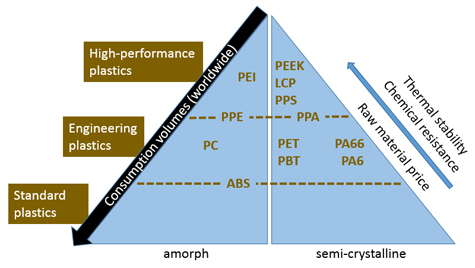 LCP materials (liquid crystal polymer) are widespread representatives of 3D-MID high-performance thermoplastics. These semi-crystalline plastic compounds contain a high degree of fillers and are characterized by excellent thermal and electrical properties as well as very good chemical resistance. Laser direct structuring (LDS) can be divided into additive and subtractive processes. In the additive LDS process, injection-molded raw materials with a metal-containing additive can be used. Alternatively, such an additive can be applied to the surface of any base body with the Protopaint special lacquer (see above). The metal nuclei are activated for chemical metallization by structured exposure with a laser along the electrical layout. In addition, the plastic surface is roughened at the exposed areas. Copper can now be chemically deposited at 5-10μm and subsequently refined with the proven ENIG process, for example. For most applications the chemically deposited Cu thickness is completely sufficient, but with appropriate layout planning in advance there is also the possibility of galvanic reinforcement. Depending on the material, the achieved adhesive strength or peel-off force of the chemically deposited copper strips is in the range of 1.4N/mm and thus higher than required by the relevant IPC PCB standard (>1N/mm). Process chain for the additive LDS method. Source: Research Association 3D-MID e.V. The subtractive LDS process is based on the assumption that the entire surface of the molded part is coated with copper. An etch resist is applied to the surface of this part and structured with the laser. Afterwards the exposed copper surface is etched away and the resist is removed again. CONTAG offers both the additive and the subtractive LDS method. Depending on design and the desired copper coating is recommended in one or the other variant. The electrical layout is a single layer as standard, but also double-sided and through-plated circuits can theoretically be realized. Both the LDS method and the 1k method are used for this purpose. 2k injection moulding process and downstream metallization and assembly processes certain requirements for the design of the basic body and the layout design. These requirements should be considered in the early development phase of your project. With the LDS method, for example, it is necessary for the laser spot to be positioned as vertically as possible in all areas as this can impinge on the base body along the electrical layout. If the base body is made of an LDS-capable thermoplastic, sharp edges with a large radius should be rounded in order to avoid foreign deposits caused by tool residues. Otherwise, an additional pre-dip process may be necessary, which roughens the surface of the base body and prevents the realizable structure resolution to 200μm line/space. Any complications caused by thermal stress and solder flow should already be considered during layout design can be counteracted. It is advantageous for stress reduction under temperature stress, avoid sharp-edged changes of direction of the tracks and round the corners of pads on the use of a solder resist can often be dispensed with. However, the transitions of pad and conductive path so that the capillary effect prevents the solder paste from flowing off. The expansion behavior and the maximum size of the components should also correspond to the CTE value of the used thermoplastics in order to achieve a too large offset to the solder contacts to be ruled out. The recommendations described here are only a selection of the most important design rules for the production of 3D-MID. For further information, please contact the CONTAG team as early as possible. Your technological task will then be checked and the optimal 3D-MID solution will be developed together with you. Materials UV-curing resins ABS, PA, PBT, PC, LCP, PEEK, etc. LCP/LCP, LCP/SPS, PBT/ PBT, etc. The automated assembly of 3D-MID is state of the art. 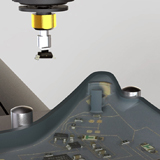 In order to ensure precise positioning of all pad surfaces to the processing heads of corresponding SMD production systems, the molded part is fixed on a multi-axis carrier and machined from above, analogous to conventional SMD assembly. The processing heads have an additional travel range of 530mm x 350mm in x- and y-direction and 150mm in z-direction. If the boundary conditions of the travel range and the accessibility of the pad surfaces from above are taken into account in the design of the part, there are sufficient degrees of freedom for equipping on inclined or curved surfaces with a small additional technical effort. Complicated special systems are not necessary. If the use of solder resist is necessary, there are two possibilities. On the one hand, before applying solder paste, solder stops can be selectively applied to sensitive areas using a separate processing head of the automatic placement machine. Alternatively, the entire base body is coated with solder resist. In a subsequent laser process, the pad surfaces to be soldered are exposed again. Common reflow soldering methods can be used for the soldering of pre-assembled components for base bodies made of high-temperature thermoplastics. For thermally sensitive substrates, selective laser soldering or other soldering processes with low-melting solder can be used. CONTAG has extensive know-how and offers a convenient complete offer for your 3D-MID project, from consulting in the initial planning phase to rapid prototyping and the production of small and large series. Our drive is the high-quality solution for your technological challenges. CONTAG is a reliable and competent partner for tasks where conventional PCB technologies reach their limits. We draw on an extensive technology pool to develop precisely tailored solutions. For further technological questions regarding the subject "3D-MID", please contact our CONTAG team (Tel. 030/351 788-300 or team@contag.de).